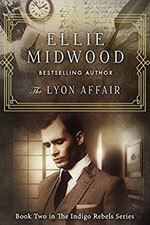 "Ellie Midwood is an undisputed queen of the historical fiction world." Welcome to the world of dashing officers and formidable villains, strong female characters and Resistance fighters, the victims of the war and war crimes perpetrators. "Midwood installs a variety of emotions through her words and an important message about the evils of war - the cost of what it does to people is far too high a price to pay." The war stories that I write are the ones where ordinary men become unlikely heroes, where the borders between good and evil are no longer distinguishable, and where uncomfortable truths are revealed through the eyes of the protagonists who don't shy away from reliving their accounts with admirable sincerity. "The depth author Midwood lends to her characters infuses each with humanness and through her characters the pages burn with emotion and authenticity." Welcome to my world, where you'll find the beauty amongst the ugliest things, where former enemies become lovers, where forgiveness shines through the horrors of the war, and where humanity will eventually defeat the darkness and a new day will start after the tired men shed their uniforms and hold their beloved ones in their arms.